Almost daily someone seems to post a photo or video with a saying that compares equestrian sports to others. Phrases like, “So, you hit a ball … isn’t that cute” accompanying a photo of some rider crashing to the ground are all over Facebook, YouTube … you name it. Then there are those slow-mo videos extolling all the ways that equestrian sport takes tough, fit athletes who have to manage a half-ton animal with a mind of its own. I will admit, now and again one hits a cord, but the uniqueness has worn thin. However, I was not prepared for one to actually disturb me. The following was making the rounds of Facebook, originally posted by the business named in the image. Okay, I get that this is supposed to be somewhat amusing, and make us feel good that what we do is a real sport. But I find it highly disturbing that a company specializing in horse products would equate a horse with an inanimate piece of sports equipment … especially one that is typically hit or kicked. Believe me, I am not normally oversensitive on these things – but there has always been mistreatment at all levels of equestrian sport, so the implication is too close to reality. We should be celebrating our sport as one where we have a partner with whom we overcome a language and social barrier to form a nearly intuitive relationship (at the pinnacle) – not as one where our piece of equipment is more dangerous than someone else’s. I’m further disturbed by the implication that the horse in the photo is exhibiting “a mind of its own”, when in reality it’s showing great discomfort. Granted, it’s possible that the gaping mouth and twirling tail are reactions to a “correction” by the rider – but the rider’s forward pointing legs indicate otherwise. At least in the moment of this photo, the rider is using her horse’s mouth for balance, which is clearly causing great discomfort. But, this is not intended as a criticism of this rider, as this easily could just be a “moment in time”. Although this may seem overly sensitive, I was disturbed further by the fact that the publication sharing the original post asked the rather ridiculous question “Does your horse have a mind of its own? Tell us about it.” Let me answer for everyone – yes, of course, every horse has a mind of its own! The point of the sport should not be to create a mechanical, mindless automaton. It is (or should be) about shaping that mind in positive ways, developing a common understanding (in spite of the barriers) and a working partnership. Maybe it’s silly … but behavioral studies have shown that perceptions can be changed by the messages we perceive as accepted. In this era of increased scrutiny toward equestrian sport, this “ad” seems highly irresponsible and insensitive. 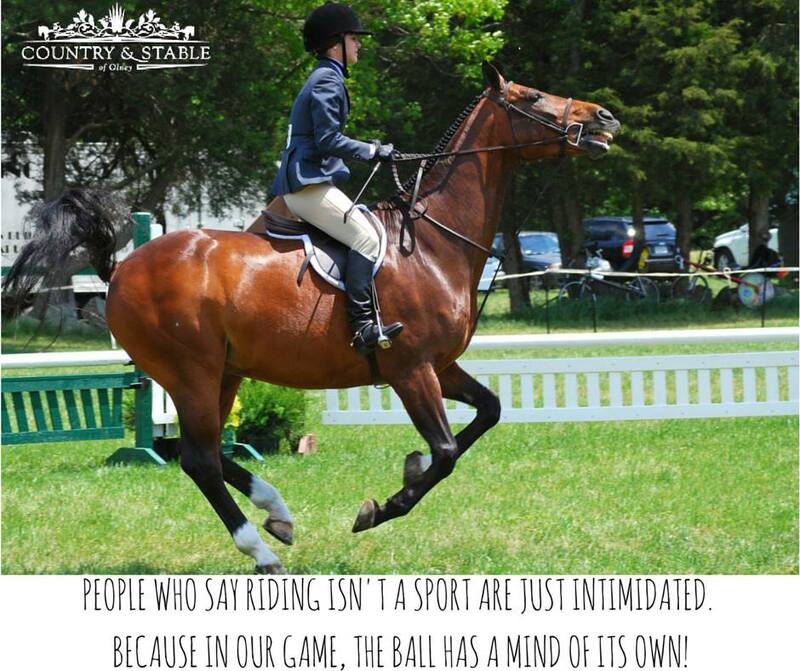 This entry was posted in Thinking Out Loud and tagged horse as ball, mind of its own, riding as sport. Bookmark the permalink. 2 Responses to Sports equipment?! I agree with you, rather than compare one sports “Equipment” to another compare it to the connection and language that we use to help that animal translate it’s own mind to use. That photo they used is awful, it’s not graceful and nice to look at. They should have used an image of a dressage horse with an outline and extended trot. That’s hard work. Any one can sit like that on a horse and pull it in the mouth. Good post! Thank you, Jessica! I agree, there are far better comparisons they could have made.